Market Volatility & new Cryptocurrency Regulations on the Horizon? Market volatility sent many investors reeling yesterday, with the dow plunging over 1,000 points. Cryptocurrency, a digital asset that is popular with cannabis entrepreneurs, was not spared. As of today, Bitcoin is trading at $7,049 per USD, down from over $18,000 a few weeks ago. Those familiar with cryptocurrency know that Bitcoin is only one type of asset, and that in fact there are multiple currencies available. One in particular, may be a potential solution to the cannabis industry’s banking crisis: PotCoin. Our Los Angeles cannabis attorneys are following developments in cryptocurrency closely and monitoring progress as regulations catch up with technology, and the state works towards a banking solution for cannabis operators. In fact, just this week, the U.S. Senate in conjunction with the SEC and the CFTC held a discussion titled “Virtual Currencies: The Oversight Role of the U.S. Securities and Exchange Commission and the U.S. Commodity Futures Trading Commission.” We will cover the results of this discussion in a future post. One of the first cryptocurrencies to ever enter the market as a cannabis coin, PotCoin, was launched on January 21st, 2014. Back then, cryptocurrencies and their applications were widely regarded by the public as a space that catered to the underground, illicit economy of the world. Potcoin describes itself as “the first digital currency created to facilitate transactions within the legalized cannabis industry.” Established around the same time as cannabis legalization in Colorado, PotCoin positioned itself as an alternative to banking, even going so as far as to installing PotCoin ATM machines at a few locations. 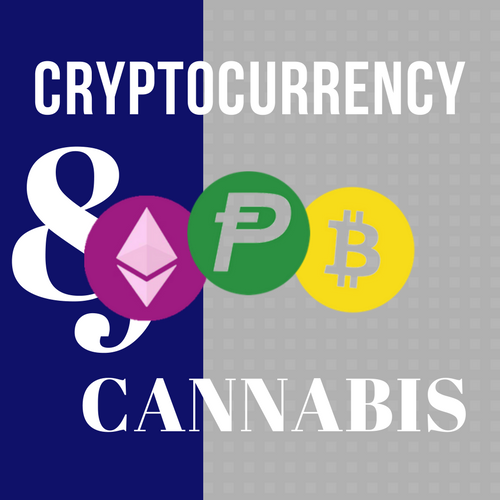 Now that the marijuana revolution in our country has garnered more support than ever, these cannabis cryptocurrencies will undoubtedly be brought up for legitimate discussion once again. Currently, PotCoin is valued much lower than Bitcoin at $0.129 USD at the time of publishing this article. How does PotCoin differ from Bitcoin? PotCoin runs on a “proof of stake” system, as opposed to Bitcoin, which runs on a “proof of work” system. This means that the individual or entity mining for PotCoin does not need an all-powerful computer with intense graphics cards, but a certain stake or ownership of the currency to mine it. This eliminates all the expensive hardware associated with the “proof of work” system, and validates the blockchain more efficiently. Through blockchain technology, PotCoins are verified while still efficiently eliminating the double-spending problem. The largest issue that PotCoin faces is one of network scalability and transaction speeds. These are both issues that the development team for PotCoin are fervently trying to solve. Whether or not PotCoin will make its mark on the economy of cannabis is contingent on how the development team addresses these key issues. With a multitude of states on the path towards the legalization of cannabis, it will be interesting to see whether or not the cannabis industry will adopt PotCoin as a potential solution to the banking quandary and certainly the development issues above will be determinative of whether PotCoin is up to the challenge.